Greetings from the enviroNow.com World Wide Web Site ("enviroNow.com Site"). The information published enviroNow.com Site is provided as a convenience to visitors, to be used for informational purposes only. While the enviroNow.com has tried to provide accurate and timely information, there may be inadvertent technical or factual inaccuracies and typographical errors, for which we apologize. We reserve the right to make changes and corrections at any time, without notice. The comments are not meant as medical advice. Please consult your doctor. The information provided on enviroNow.com Site is provided "AS IS," "AS AVAILABLE." enviroNow.com does not warrant the accuracy or completeness of the information, text, graphics, links, or other items contained on enviroNow.com Site, and enviroNow.com expressly disclaims liability for errors or omissions in these materials. enviroNow.com makes no commitment to update the information contained enviroNow.com Site. enviroNow.com assumes no responsibility for and expressly disclaims all liability for errors or omissions in, and use or interpretation by others of, any information contained on any other site from which any person may have accessed enviroNow.com Site. enviroNow.com expressly disclaims all liability for the use or interpretation by others of information contained in enviroNow.com Site. Decisions based on information contained in enviroNow.com Site are the sole responsibility of the visitor, and in exchange for using enviroNow.com Site the visitor agrees to hold enviroNow.com and its affiliates harmless against any claims for damages arising from any decisions that the visitor makes based on such information. Nothing contained in enviroNow.com Site constitutes advice. Except as otherwise noted, the text and graphics provided on enviroNow.com Site are copyrighted by enviroNow.com or another entity. 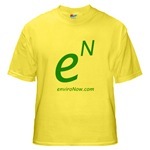 enviroNow.com's name, logos, and trademarks may not be otherwise used by the visitors in any manner without the prior written consent of enviroNow.com. Technical & General questions or comments about enviroNow.com Site may be directed to enviroNow.com Webmaster. By providing information (such as feedback, data, answers, questions, comments, suggestions, plans, or ideas) to enviroNow.com, the visitor agrees that such information shall be non-confidential and that enviroNow.com shall have unlimited rights to use (or not use), distribute (or not distribute), reproduce (or not reproduce), and disclose (or not disclose) such information worldwide as enviroNow.com deems appropriate, without compensation or acknowledgment of its source. enviroNow.com will not distribute or share with third parties e-mail addresses or names collected through enviroNow.com Registration. However, enviroNow.com shall be free to use any ideas, concepts, know-how or techniques contained in information a visitor provides enviroNow.com through enviroNow.com Site, including but not limited to developing, manufacturing, and marketing products or services incorporating or otherwise based on such information. Visitors to enviroNow.com Site assume all responsibility and risk for the use of enviroNow.com Site. enviroNow.com and its affiliates disclaim all warranties, representations and endorsements, express or implied, with regard to information accessed from or via enviroNow.com Site, including but not limited to all express and implied warranties, including the warranty of title, merchantability, fitness for a particular purpose, non-infringement, and freedom for computer virus. enviroNow.com does not assume any liability or responsibility for the accuracy, completeness, or usefulness of the information disclosed at or accessed through enviroNow.com Site. In no event shall enviroNow.com nor its owners be liable for any direct, special, indirect, or consequential damages, or any other damages of whatsoever kind resulting from whatever cause, including but not limited to loss of use, loss of profits, or loss of data, whether in an action under theories of contract, negligence, or strict liability, or otherwise, arising out of or in any way in connection with the use or performance of the information on, or accessed through, enviroNow.com Site. Reference in enviroNow.com Site to any products, services, processes, hypertext links, or other information, by trade name, trade mark, manufacturer, supplier, or otherwise does not necessarily constitute or imply enviroNow.com's endorsement, sponsorship, or recommendation.